Catfish paprika is an unbeatable Hungarian food! It's not too difficult to cook and the taste of it is gorgeous. So, I highly recommend trying it out. We Hungarians are very lucky as we have lots of rivers and lakes, which are full of Catfish. Especially the river Tisza is very famous for her catfish. It is not rare for fishermen to catch 50 kg catfish in weight (110 pounds), or even bigger. One of my big dreams is to catch at least one of these giants. 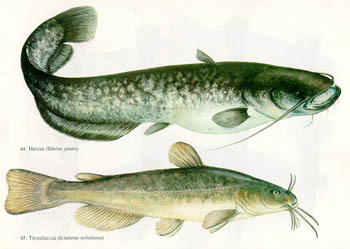 Catfish belongs to the group of white freshwater fish. With its flat head, wide mouth and scale-less body it is a delicious fish; safe to eat, for it has no bones. Its skin however is inedible, so you need to remove it before cooking. This is very important. Please don't forget it! If you plan to visit Hungary and you have time to visit Szeged, it is worth to try this delicious Hungarian food in one of the restaurants by the bank of river Tisza (e.g. Halaszcsárda by the bridge called Belvárosi híd). 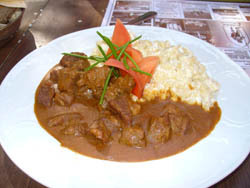 Of course you can find also restaurants in Budapest, which offer great Catfish stew. I hope by now you are curious to try the recipe for Catfish paprika, so let's get started! What kind of ingredients you need for 4 people? Chop the fish fillets on cubes, season with salt and fry them in hot oil, then put aside. Slice the onion and paprika in fine pieces and chop the tomato in small cubes. Brown the finely chopped onions in the same oil as you used for the fish. Then sprinkle with ground paprika and add the chopped green peppers and tomato. Add the fish fillets and cover, and then simmer for 10 minutes. While the Catfish paprika is boiling, mix sour cream and flour. After 10 minutes reduce with this mixture and add the butter in tiny bits. Cook everything together for couple of minutes and it is ready! The fish meat will collapse. The only thing what you can do is carefully jiggle the pot. Garnish with sour cream upon serving. Serve with Hungarian cheesy noodles or Little Hungarian Dumplings. I hope your first Catfish paprika was a great success. I’m always happy to hear about your success stories, so please share it with me. If you have questions or you have some problems with the recipes, please contact us and we’ll help you.